When a monster(s) is Summoned: Destroy all monsters on the field. This card is the opposite of Torrential Reborn; it destroys Summoned monsters. Whereas Torrential Reborn Special Summons destroyed monsters. Despite that this card's name would insinuate the Tributing of monsters, it destroys them instead. This trait is also shared with cards like Royal Tribute and the anime-only Double Tribute, the latter of which is also a Normal Trap Card that destroys monsters upon a monster's Summon. Battle Fader: When you resolve the effect of "Battle Fader" you Special Summon "Battle Fader" and then end the Battle Phase. "Torrential Tribute" cannot be activated because ending the Battle Phase is the last thing to happen. Ido the Supreme Magical Force:" The effect of “Ido the Supreme Magical Force” that Summons it in the Standby Phase, and its effect that destroys all other monsters, happen simultaneously. Therefore, you can activate “Torrential Tribute” or “Bottomless Trap Hole” when it Summons itself, as you have not missed the timing. Gravekeeper's Spy: If the effect of "Gravekeeper's Spy" is activated after it is Flip Summoned and "Torrential Tribute" is chained, then 1 "Gravekeeper's" monster will still be Special Summoned and it wont be destroyed by the effect of "Torrential Tribute". Scrap Dragon: In order for the 2nd effect of "Scrap Dragon" to activate, you must be both the owner and controller of the card when it is sent to the Graveyard. You can activate "Torrential Tribute" even if a monster(s) is Special Summoned face-down by an effect like "The Shallow Grave" or "Cyber Jar". Battle Fader: The effect of "Battle Fader" which Special Summons it and the effect which ends the Battle Phase are not treated as resolving at the same time. After "Battle Fader" is Special Summoned, effects like "Torrential Tribute" cannot be activated since they miss the timing. : Can effects like "Torrential Tribute" be activated when "Battle Fader" is Special Summoned? Ido the Supreme Magical Force: Destroying monsters and Special Summoning "Ido the Supreme Magical Force" are considered to occur simultaneously. You can respond to the Special Summon with "Bottomless Trap Hole" or "Torrential Tribute". : When "Ido the Supreme Magical Force" is Special Summoned and destroys monsters, can you activate "Bottomless Trap Hole" without missing the timing? Relieve Monster: If "Relieve Monster" resolves and Special Summons a monster, then "Torrential Tribute" or "Bottomless Trap Hole" can be activated at this time. The Replay occurs after resolving those effects. : Can something like "Torrential Tribute" be activated if "Relieve Monster" Special Summon a monster? Starlight Road: Suppose "Heavy Storm" is activated while there are two or more Spell/Trap Cards on the field, and "Starlight Road" is Chained. After "Starlight Road" Special Summons "Stardust Dragon", the resolution of the negated "Heavy Storm" still occurs, so "Torrential Tribute" cannot be activated since you miss the timing. : Can cards like "Torrential Tribute" be activated when "Stardust Dragon" is Special Summoned by "Starlight Road"? ZERO-MAX: The effect of "ZERO-MAX" which Special Summons an "Infernity" monster and the effect which destroys all face-up monsters are not treated as resolving at the same time. Even if there are no monsters on the field, then it is treated as finishing resolving with the destruction of monsters. Thus, even if "ZERO-MAX" does not destroy monsters, then you cannot activate cards like "Torrential Tribute" because you miss the timing. : Are the "draw" and "destroy" effects of "ZERO-MAX" treated as being done at the same time? 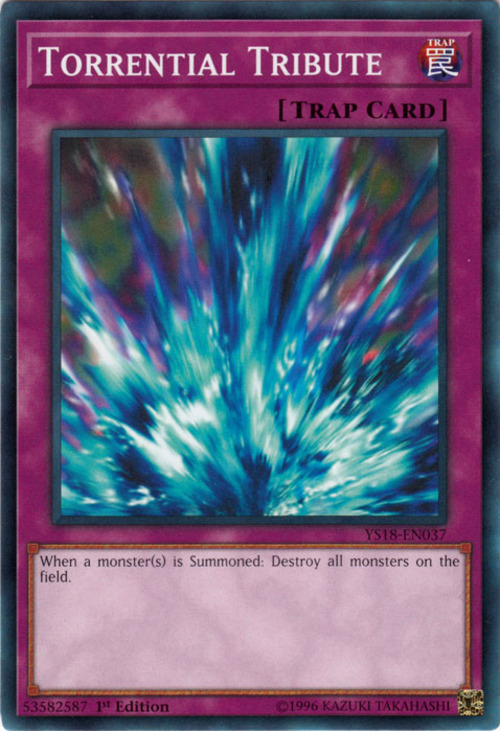 For effects like "Future Visions" and "Interdimensional Matter Transporter", when the removed from play monster is returned to the field the monster is not treated as being Special Summoned, so effects like "Torrential Tribute" may not be activated. : When a monster which was removed from play by "Future Visions" or "Interdimensional Matter Transporter" returns to the field, is it treated as a Special Summon? Morphtronic Forcefield: You can activate "Morphtronic Forcefield" against "Torrential Tribute" if there is a "Morphtronic" monster on the field. : Trap Card > Morphtronic Forcefield: Can "Morphtronic Forcefield" be Chained to a card which does not target? Relieve Monster: If "Torrential Tribute" is used against the monster Special Summoned by "Relieve Monster", the replay occurs after "Torrential Tribute" resolves. : Can "Torrential Tribute" be activated when "Relieve Monster" Special Summons a monster? Stardust Dragon: If "Stardust Dragon" Special Summons itself during the End Phase, and your opponent activates "Torrential Tribute", then you can activate "Stardust Dragon"s effect to negate "Torrential Tribute". "Stardust Dragon" will then Special Summon itself again during the same End Phase. : Can "Stardust Dragon"s effect be activated multiple times during the same End Phase? The Wicked Avatar: When "The Wicked Avatar" is Tribute Summoned, its effect begins a chain. You can chain "Bottomless Trap Hole" or "Torrential Tribute" to this effect. : When "The Wicked Avatar" is Summoned, can "Bottomless Trap Hole" or "Torrential Tribute" be activated? Junk Collector: If "Junk Collector" is the only monster on the field, then you cannot remove from play "Ceasefire" to activate its effect; if you did, then there would be no monsters on the field after activation, so the damage-inflicting effect cannot be applied. 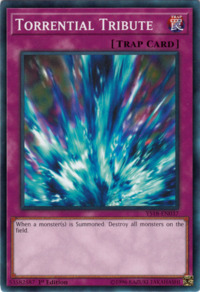 Likewise, if "Junk Collector" is Summoned and is the only monster on the field, then you cannot remove from play "Torrential Tribute" to activate its effect; if you did, then there would be no monsters on the field after activation, so the effect which destroys monsters cannot be applied. : Can cards like "Ceasefire" or "Torrential Tribute" be removed from play to activate the effect of "Junk Collector"? "Torrential Tribute" is activated after a monster is Summoned; it is not chained to the Summon. So you cannot activate "Torrential Tribute" when "Jinzo" is Summoned. "Torrential Tribute" can be activated after a monster is Summoned through another card’s effect, such as "Monster Reborn", "Scapegoat", "Cyber Jar" (if Flip Summoned), or "Call of the Haunted". "Torrential Tribute" can be activated after a Flip Summon, but it does not negate the Flip Effect (it is chained to the Flip Effect). When monsters are Special Summoned face-down by an effect, like "The Shallow Grave", "Torrential Tribute" can be activated. Amplifier"Jinzo with Amplifier", your Trap Cards are not negated and their effects are applied, including "Torrential Tribute"
Aurkus, Lightsworn Druid: "Aurkus, Lightsworn Druid" will NOT stop "Torrential Tribute", because these effects do not target. Celestial Transformation:" You can activate "Torrential Tribute" after a monster is Special Summoned with the effect of "Celestial Transformation". Creeping Doom Manta / Eagle Eye / Tactical Espionage Expert / Invasion of Flames:" The effect of this monster prevents the activation of Trap Cards that can be activated when a monster is Normal Summoned, such as"Torrential Tribute". Cyber Jar:" "Torrential Tribute" can be used on monsters Summoned by "Cyber Jar" but not if "Cyber Jar" was flipped face-up in the Damage Step, since "Torrential Tribute" cannot be activated during the Damage Step. Elemental HERO Wildheart:" You may activate "Torrential Tribute"Elemental Hero Wildheart"Elemental Hero Wildheart") will be destroyed. Fiend Skull Dragon:" Cards such as "Torrential Tribute"will all apply their effects to "Fiend Skull Dragon" because these cards do not target. Flying Kamakiri 1 / Giant Rat / Mother Grizzly / Shining Angel / Mystic Tomato / UFO Turtle: Since the Special Summoning occurs during the Damage Step, "Torrential Tribute", etc. cannot be used. Forced Back:" You can activate "Forced Back" when you Normal or Flip Summon your own monster. You should announce this immediately after your Summon. Once you allow your opponent to activate "Torrential Tribute" you are acknowledging that the Summon was successful and you cannot activate "Forced Back". Gladiator Beast: You can activate "Torrential Tribute", etc. when a "Gladiator Beast" monster is Special Summoned at the end of the Battle Phase. Greenkappa:" You can chain to the effect of "Greenkappa", even with the targeted Spell or Trap Cards. If only 1 of the 2 cards is chained, "Greenkappa" will still resolve and destroy the other. If "Greenkappa" is destroyed in a chain to its effect (such as with "Torrential Tribute") its effect still resolves. Heart of Clear Water:" A monster equipped with this card can still be destroyed by effects that do not target, such as the effects of"Torrential Tribute". Jinzo: When "Jinzo" is Tribute Summoned, cards like "Trap Hole" and "Torrential Tribute" cannot be activated because "Jinzo's" Continuous Effect is applied when it is Summoned, but you can negate its Summon with "Solemn Judgment", "Horn of Heaven", etc. King's Knight:" When "King's Knight" is Normal Summoned, its Trigger Effect starts a chain if "Queen's Knight" is on the field. If the opponent chains "Torrential Tribute" to destroy "King's Knight" and "Queen's Knight" you still Special Summon "Jack's Knight". Magical Dimension:" If your opponent activates "Magical Dimension" and chooses not to destroy a monster on the field, then you can activate "Torrential Tribute"to destroy the Special Summoned Spellcaster. If your opponent does decide to destroy a monster, then you cannot activate these cards because the last thing to happen was not a monster being Summoned. So you have missed the timing. Marauding Captain:" If your opponent activates "Torrential Tribute" in response to the Summoning of "Marauding Captain" (by chaining to the Trigger Effect of "Marauding Captain"), all monsters on the field will be destroyed, and then you Special Summon for "Marauding Captain"s effect. If they wait and activate "Torrential Tribute" in response to the Special Summoning of a monster for the effect of "Marauding Captain", then all monsters will be destroyed including the newly-Special Summoned monster. My Body as a Shield:" "My Body as a Shield" will negate cards such as"Torrential Tribute"
Prime Material Dragon: "Prime Material Dragon's" second effect works like "My Body as a Shield". "Prime Material Dragon" can negate cards such as "Torrential Tribute"
Skull Knight 2:" If the opponent chains "Torrential Tribute" to the effect of "Skull Knight #2", all monsters will be destroyed (including the Level 5 or higher Fiend-Type monster that was Tribute Summoned) and then "Skull Knight #2" will be Special Summoned from your Deck. If the opponent waits until the effect of "Skull Knight #2" resolves and another copy is Special Summoned, and then activates "Torrential Tribute" in response to that Summon, all the monsters will be destroyed. Stardust Dragon:" If you Special Summon "Stardust Dragon" during the End Phase and your opponent activates "Torrential Tribute", you can chain "Stardust Dragon's" first effect to negate "Torrential Tribute". If you do, you can Special Summon "Stardust Dragon" again during the same End Phase. The Dragon's Bead:" You can only activate the effect of this card to negate a Trap Card that targets a face-up Dragon-Type monster, so it cannot negate"Torrential Tribute"
Time Machine:" Cards like "Torrential Tribute" cannot be activated when a monster is Special Summoned by "Time Machine", because cards like "Torrential Tribute" cannot be activated in the Damage Step. Trap Monster: When “Embodiment of Apophis” is Special Summoned, you can activate “Torrential Tribute” just like with any other Summon. Tyrant Dragon:" When you Summon "Tyrant Dragon", the opponent can activate "Torrential Tribute"and destroy "Tyrant Dragon" because neither of these Trap Cards target. Zombie Master: "Zombie Master's" effect is a Spell Speed 1 effect, so you can't chain it to a Spell Speed 2 effect like "Book of Moon", "Bottomless Trap Hole", "Torrential Tribute", "Compulsory Evacuation Device", etc. : Clarification on Zombie Master-effect negated? 3-Hump Lacooda: If you Summon your third "3-Hump Lacooda", you can activate its effect before your opponent activates "Torrential Tribute".This is no longer correct due to the removal of Ignition Effect priority. D.D. Survivor:" If "D.D. Survivor's" effect is activated in the End Phase, and it is removed from play again (by "Bottomless Trap Hole", or "Torrential Tribute" while "Dimensional Fissure" is in play, etc. ), its effect will activate during the next turn's End Phase.The latest errata of "D.D. Survivor" states that it can only activate its effect during the turn it was banished, making this ruling invalid. Uria, Lord of Searing Flames:" When a player Special Summons "Uria, Lord of Searing Flames" and activates its effect to destroy a Set Spell or Trap Card, no Spell or Trap card can be chained, including"Torrential Tribute"